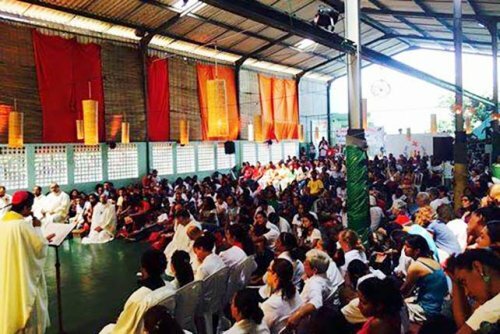 A “jornada da confiança”, as the meetings of the Pilgrimage of Trust are called in Brazil, was held from October 9 to 12 in Salvador in the parish of Nossa Senhora da Conceição da Lapinha. 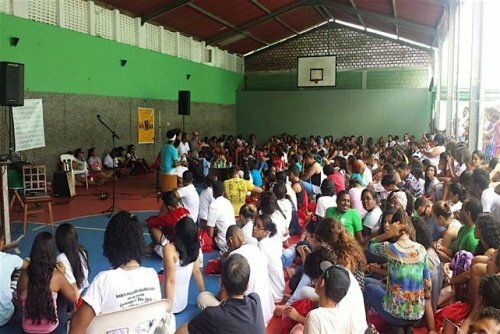 Nearly five hundred young people from different cities of Bahia took part in it, some from even further, and even two young people from Bolivia. The adventure began in late May when young people from the parish of Lapinha came to Alagoinhas - a city 120 km from Salvador, where some Taizé brothers have been living for nearly 40 years. They had heard about the meetings that the brothers had organised in different cities of the country in the last few years, and proposed to organise a meeting of its kind open to all who would come to their parish. The brothers, being only two in the fraternity in recent months, were only able to accompany the preparation of the meeting from afar, only just managing to visit the youth of the preparation team twice. The preparation team in turn also came twice to Alagoinhas to speak with the brothers about the progress of the preparation and to draw courage to continue. For the youth in a such a poor neighbourhood there were many challenges to face. At times, faced with financial difficulties, they wanted to abandon everything; at other times they failed to agree — also a reality. But all this they endured, and, after four months of preparation, their journey of trust, perseverance and faith was revealed after the meeting to have been an extremely powerful experience. "During these four days, we have experienced more than we had hoped for, everything was ready for us. Some things were not as I had expected, but I felt joyful to see that those who were there were happy. Being welcomed with so much love and affection is unforgettable, and it’s really rewarding to share, have fun, stay in silence, communing with people I had never seen in my life and who are now part my story. I do not know yet what really touched me, but I can say that this encounter made me change a lot. I hope to experience another. Now I can say that it really is a “pilgrimage of trust”. And the pilgrimage does not stop today, these four days were just the beginning of a great pilgrimage that we still have before us." I arrived in Salvador four days before the meeting; it was an opportunity to get to know a little parish that welcomed us and the young people who had prepared the jornada. It was quite a popular parish, located in the old city of Salvador, just above the port. The parish is very much alive, with all generations represented, and almost every night a group meets in the church. We were housed in the parish house, and the ten young people from the preparation core team came to live with us during these eight days. What struck me is how the young people have been quietly but faithfully accompanied by the adults. These adults never promoted themselves; they simply began serving the young people. The adults did not tell them how things had to be done, but when the young people needed their help, they were there. The adults took care of the logistics, and, because everything was freshly cooked, they sometimes worked from six in the morning until midnight! Other faithful friends also quietly gave assistance necessary for the realisation of such a meeting. During the meeting, all the young people were housed in a school centre; it surprised me to discover that, knowing how welcoming the families are, but I understood that because of the insecurity and violence of the situation in many districts of Salvador, it was practical to consider young people having to make their way back to families in the evening. For five hundred young people from all over Bahia, it was an adventure to organise the trip. It’s not just about saving money: there is nothing to save when you have nothing; it required finding a way to earn money. At Alagoinhas, for weeks young people prepared fruit salad that they sold at the end of mass in order to pay for their stay. The vigil began Saturday night in the Church of the Trinity, near the parish, next to the harbour. In this large abandoned and very degraded baroque church, a Frenchman, Eric, who has shared the life of the homeless in Salvador for many years, obtained from the diocese, fifteen years ago, permission to welcome people from the street. Today, built around some people who heard the call to share their lives and to help in this way, the community of the Trinity brings together men and women who have passed the night on the street, with all the consequences that that implies for their own lives. They seek to welcome other brothers and sisters who have not yet discovered the gospel invitation of Jesus, “Get up and walk!”, or who have tried to, but fell back into drugs and alcohol. The majority of them are housed in the three naves of the church and sleep on large boxes that fold away into storage in the morning on the sides of the naves ... They pray three times a day, in a manner largely inspired by prayer at Taizé. Getting there was an adventure for the young people; they had to go down a steep slope, along an overflowing drain, through a fish market and its strong odours, pass under a bridge where the homeless were beginning to settle down for the night and then arrived at the church. The young people had their eyes opened from what they had gone through and from entering this church, which its somewhat unusual in its appearance because it is where everyone sleeps. 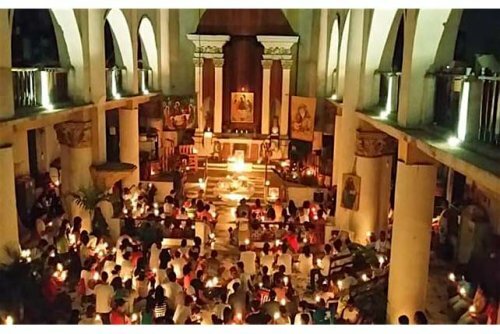 When lighting the candles for the celebration of the resurrection, the oldest people from the street carried the light, and it was with that light that young people processed, to continue the vigil in the parish. This vigil was remembered particularly young people who often experience very difficult situations. On Sunday morning the auxiliary bishop came to celebrate the Eucharist for the young people, who included a large group from his own diocese. At the end, he wished that many parishes of Salvador could experience such a meeting. He was grateful that we had trusted the young people and that we had enabled them to live this powerful experience of faith and trust. There is an urgency: in Brazil there is a real crisis of meaning and references, especially for the young people, and this crisis is even stronger with economic and political decline facing the country for the last two years. This country, which for years had been through an extremely difficult situation that was later found among the large emerging countries, now sees itself again plunged into trouble, largely because of leaders in whom they had believed and who have revealed themselves as corrupt as others. This creates a strong hopelessness among young people, and this is probably also one of the causes of the increased violence that affects Brazil.